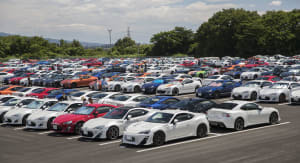 Having attended the 2015 Nismo Festival at Fuji Speedway, I think I have some idea what I’m in for as we head once again to the legendary track in the foothills of Mount Fuji for the 2016 Toyota 86 Style event. As a former owner of two AE86 Sprinters, I’m pretty excited to finally have a close look at some JDM examples in the flesh. I’ve seen a few running round the streets of Tokyo alone, but never a collection in one place. The 86 Style event was first held back in 2010 and is always run as close as possible to August 6th, with Hachi (8) and Roku (6) paying homage to the original AE86 – or Sprinter as it was known in Australia. 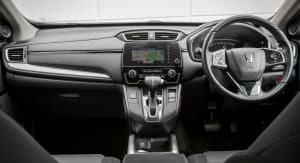 In 2010 and 2011, the event catered only for the classic AE86, but with the launch of the modern Toyota 86 in 2012, the event expanded significantly once the new car was welcomed into the fold. In 2013, the Subaru BRZ was also invited to attend and 86 Style is now the biggest festival for the 86 anywhere in the world. It might be a bit of an exercise to get to Japan just for a car show, but if you’re into modified 86s, there’s absolutely no doubt it’s worth the effort. 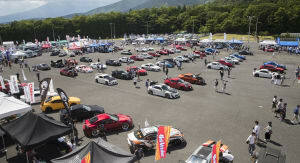 This year, the 86 Style event was once again a raging success with more than 9000 fans attending the one-day event. We spoke to people from all over the world, too. 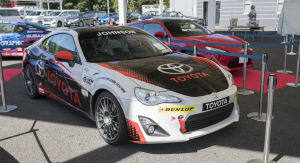 As mentioned above, it’s open to both Toyota 86 and Subaru BRZ as well, with 2000 and 600 entrants of each respectively. 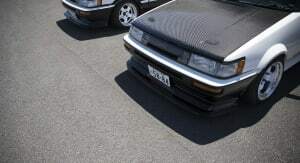 Additionally, there were also 300 classic AE86 examples on display. Take a look at the photos of the car parks packed full of vehicles. The scale of the event, across various facilities within the Speedway complex is truly immense. Driving into the complex, the number of new 86/BRZs in the various smaller track facilities around the complex is hard to comprehend. That’s before we even get to the main circuit. 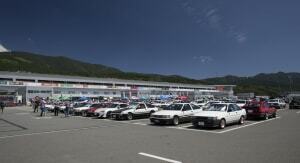 It’s like every single example sold in Japan has converged on Fuji Speedway – especially the remaining classic AE86s. The Speedway is a truly epic facility, with a different track setup around every corner, and the positioning of it in the shadow of Mount Fuji making the backdrop even more stunning. There’s a drift track, an undulating and tight, short circuit (where we tested the facelifted 2017 Toyota 86 the day before), various different motorkhanas and wet skid pan activities, not to mention carparks full of punters’ vehicles. It’s absolutely mind boggling. 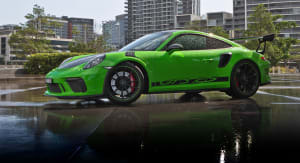 There’s also driving and demonstration action taking place all day on the main circuit, with 86 race cars of all kinds heading out over the course of the day. Toyota Australia has even sent the Aussie-built 86 Shooting Brake and one of its one-make 86 race cars over for the festival. 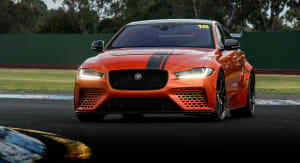 Both are surrounded by fans all day, especially the Shooting Brake. 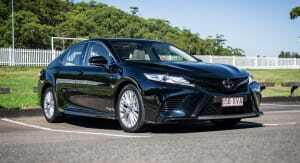 You get the feeling if the fans had any sway, Toyota would be putting it into production ASAP. 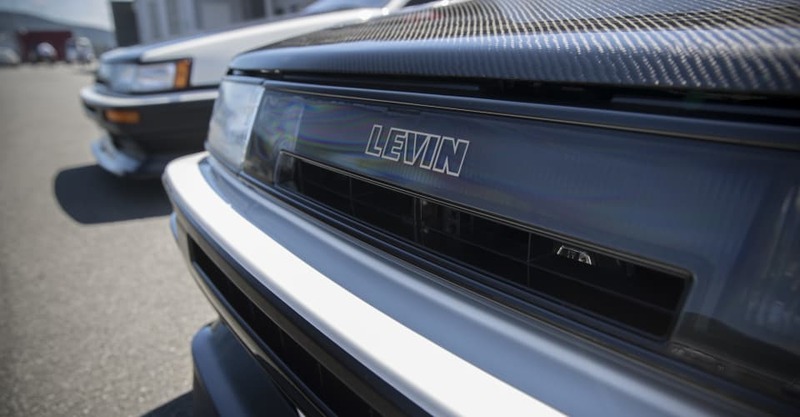 Drift legend Keiichi Tsuchiya got behind the wheel of the Shooting Brake the day before and absolutely loved it – rest assured he gave it a workout on track despite it being a one-of-one concept! The parking lot behind the main pit area is full to overflowing with modified Trueno and Levin variants and for me, it’s the place to be. These humble little hatch- and notch-backs have become the stuff of legend around the world and the price has gone up accordingly. 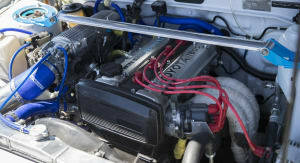 We didn’t get the best of Toyota’s Eighties engineering in Australia, namely the 4A-C SOHC carburettor engine compared to the 4A-GE under the bonnet of the JDM version, but regardless, the Sprinter is still a hugely popular car in Australia. 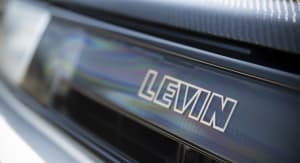 JDM variants got the superior fuel injected engine, but also featured rear disc brakes, an LSD and more luxurious interiors. Absolutely every kind of period aftermarket JDM wheel is on display, not to mention bodykits, crazy ground effects additions and all manner of engine modifications. 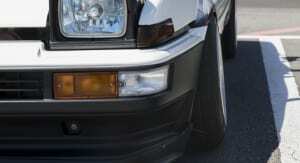 In short, it’s AE86 heaven. Interestingly, there aren’t too many examples with crazy engine swaps as we see in places like Australia and the US. It seems there’s a real badge of honour in Japan associated with running the 4A-GE. Think of something you’d love to see done to an 86 though and you’ll find it here. I see names I haven’t seen since a previous life when I edited modified car magazines, and all the big tuning factories are in attendance too, including Work, Rays, APEXi, Bride, JBlood, Project Mu, Fujitsubo, TRD, Tom’s and Tomei just to name a few. It’s Tuning Nirvana in the parking lot, with plenty of uber cool parts available to purchase. Most of the current crop of big name drifters are in attendance, as well as Tada-san (the father of the new 86), Keiichi Tsuchiya (the drift king), Takuma Sato (former F1 driver) and most of the major 86 race teams from around Japan. There’s plenty of cute grid girls in sky high heels posing for photographs with punters too, adding a bit of glamour to the event and the locals treat them like celebrities. 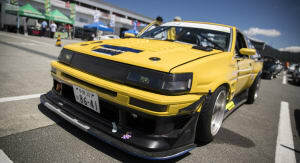 In typical Japanese style, the event is an orderly, fun, well organised and incredibly diverse celebration of just one aspect of car culture in a car-mad country. World Time Attack is probably the closest thing we have to this kind of event in Australia these days, and many of the big name Japanese drivers and tuning companies will be heading to Australia for that too. After a day wandering around, we’re blown away by the love for the humble 86 – both old and new – and the commitment to making automotive tuning culture accessible to anyone who wants to partake. You can see after a day spent soaking it up, why there is such passion at manufacturer level for a vehicle like the modern 86. 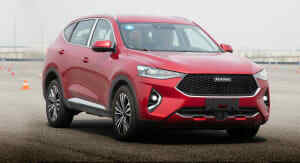 It’s in the fabric of the DNA of the people to drive affordable sports cars and the Japanese revel in it like nowhere else in the world. 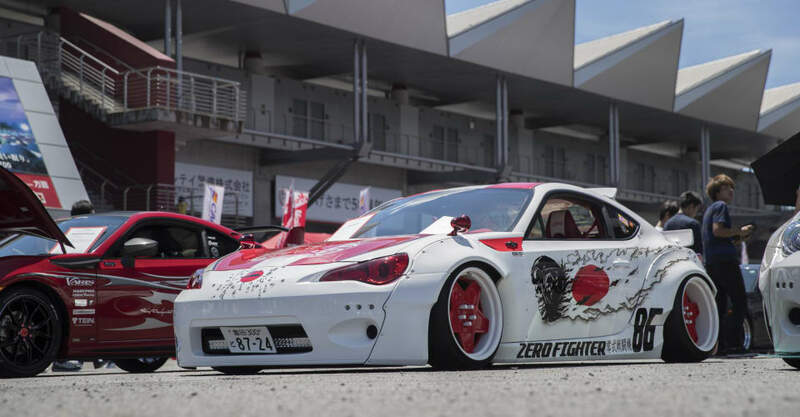 There’s no doubt Japan leads the way when it comes to this kind of showcase, right up there – perhaps beyond even the US – and if you’re a fan of the 86, put this event on your calendar. Click on the photo tab for more stunning pictures of the Toyota 86 Style at Fuji Speedway.